It’s the Laydeez Do Comics festival this weekend, at the Free Word centre in London. Why not come along? Laydeez Do Comics is a “women-led but not women-only” organisation with chapters in cities across the UK and beyond. For the past couple of years, they’ve run an award for a graphic work in progress by a female identifying artist, and the festival is a culmination of this year’s award process. On Sunday, it will be open to the general public so that they can browse all the entries, eat cake, and find out who will be awarded the prize. 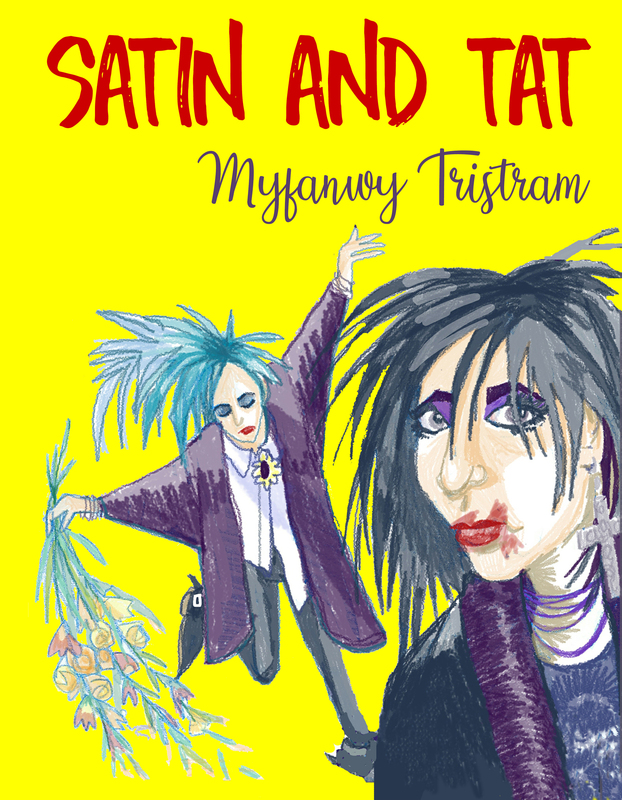 I’m proud to say that my own work in progress, working title Satin & Tat, was one of the longlisted works, although it didn’t go on to be shortlisted. That said, it is very difficult to be anything but grateful for LDC, because they’ve structured the whole award very cleverly to benefit everyone who enters, and not just the winner. You’re instructed to submit the first twelve pages of your work, both in digital form and as a printed comic. Along with this you must provide your biography and a short summary of the plot. By fulfilling the conditions of entry, you may not realise it, but you are creating everything that would be required were you to pitch your work to a publisher or agent. And there will be publishers in attendance at the festival – hopefully, publishers on the lookout for new creators to work with. That’s not all, though: in order to help fund the monetary prize, LDC ran a number of professional development workshops and one-to-one consultations with practising graphic novelists. I went along to a workshop by Karrie Fransman in which she very generously shared her top tips for positioning your work and making it appealing to a publisher. So now I feel very well equipped to go and give my elevator pitch and share the comic I’ve been working on for over a year, to anyone who might like to hear about it. It does feel like it’s about time it saw the light of day and got some feedback from people outside my own circle of friends and family! Since creating the comic that I submitted for the award, I’ve continued to refine it, so I’ve actually put together a much fuller pitch package which I’ll be sharing with some publishers soon – ones that seem a good fit for this loss of innocence story that takes place against the background of the goth fashions, music and hairstyles of 1985. While I was already working away on this graphic novel, I don’t think it would’ve been in anything like such a good state to share without Laydeez Do Comics giving me something to work towards, so great thanks to them. PS, I should also mention that I’ll have a handful of Satin and Tat zines to sell. These are extra copies of my entry, so they contain the first 12 pages along with a synopsis etc. Talk about a very limited edition: there are only four or five available. As an extra incentive I’ll include a goth cut-out doll and one of the prints of the kimono’d bike rider as well.